Here we have two more 4-4-0s. A pretty engine, though its short coupled wheelbase made for a rough ride. The model is entirely scratch-built. Power is provided by a tender-mounted Portescap 1219 motor with a small flywheel and a simple bent wire cardan shaft to a worm gear in the engine firebox. This feeds a double-reduction gear drive, giving an overall reduction of 37:1. Both engine and tender have split frames with wheels from the late Mike Bryant range, all wheels collecting current. Transfer between the engine and tender is by phosphor-bronze springs, soldered to the tender frames and bearing on the insides of the engine frames. This enables the easy separation of the loco and tender. The engine and tender superstructures are of plastic card with metal details and fitting and rolled lead sheet ballast in the firebox and rear of the boiler. 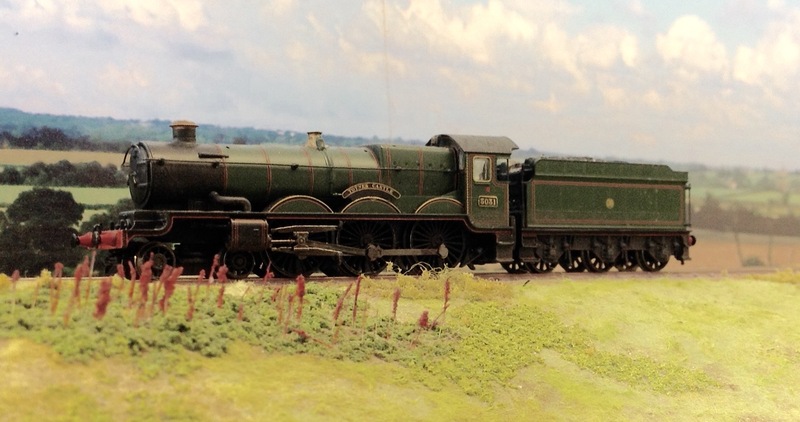 This model won the 2mm Scale Association Groves Trophy in 1984. A vintage engine with beautiful proportions. Again, the model is entirely scratch-built. Similarly, power is supplied by a tender-mounted Portescap 1219 motor, with a small flywheel and a simple bent wire cardan shaft to a worm gear in the engine firebox. This feeds a double-reduction gear drive, giving an overall reduction of 37:1. Both engine and tender have split frames with wheels from the late Mike Bryant range, including extended-axle drivers, all wheels collecting current. Transfer between the engine and tender is by phosphor-bronze springs, soldered to the tender frames and bearing on the insides of the engine frames. To avoid excessive sideways movement on curved track, the rear axle of the bogie is in the main frames, with some side-play, and the front axle is in a separate pony truck. In essence it is built as a 2-2-4-0. The bogie outside frame is supported at the rear by a pivot on the main chassis and, at the front, a pin-in-slot on the pony truck. The engine and tender superstructures, details and fittings are of sheet and turned metal, with rolled lead sheet ballast. This model won the 2mm Scale Association Members' Choice Cup. A pair of mixed traffic 4-6-0 locomotives, very much of Great Western standard design. Both models are largely "straight out of the box" - we GWR aficionados have been lucky with proprietary models over the last few years. 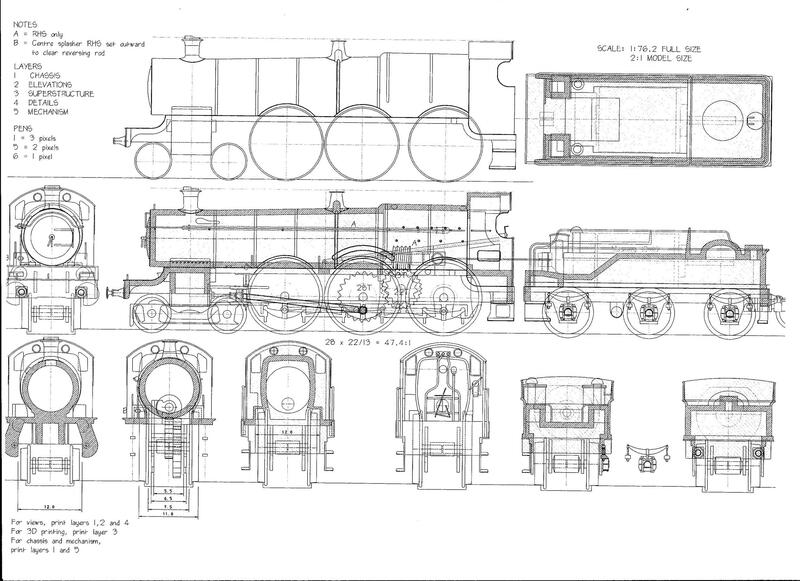 A smaller-wheeled version of the Hall class, in part re-using components from redundant 43xx class 2-6-0 Moguls. This model is proprietary, by Dapol, with a tender-mounted skew-wound motor and a plastic cardan shaft drive to the driving wheels. The tender was modified, plastic coal removed and replaced with the real thing and the coupling replaced. Otherwise, the main changes are more robust current connection between loco and tender and a partial repaint and weathering. A smaller-boilered version of the Grange class. This model is proprietary, by Ixion/Dapol, with a tender-mounted skew-wound motor and a plastic cardan shaft drive to the driving wheels. Again, the tender was modified, plastic coal removed and replaced with the real thing. Otherwise, the main changes are more robust current connection between loco and tender and a partial repaint and weathering. Another pair of Great Western standard engines. The Hall was the GWR all-purpose main line engine. The model started life as an ancient Farish Hall – with severe modifications. The mechanism was adapted with a replacement worm and worm wheel set (Ultrascale) giving a 38:1 reduction instead of the original 25:1. The three-pole armature was replaced with a five-pole and the pole pieces were ground down to allow for the scale diameter driving wheels and thinned to fit in a waisted firebox. * The model's original firebox walls were reduced in thickness, particularly below the centreline of the boiler, and then a wrapper of nickel-silver shim was epoxied to the ground-down firebox and fettled. Cosmetic frames with springs and brakes were bonded to the chassis block and a new keeper plate was made from copper-clad fibreglass with phosphor-bronze wire pickups. Driving wheels were from the Beaver range with scratch-built rods. The pony truck was a modified Peco Jubilee unit and the cab was scratch built. The tender superstructure was an unmodified 4000 gallon type but with details added. * This pre-dates the availability of small replacement motors (Nigel Lawton 7mm, etc). Be careful if you are trying this at home - first you need to remove the magnet, then push out the aluminium rivets that hold the pole pieces. When working on the pole pieces, take care to avoid reducing the cusps - these need to bear on the chassis block to stop the pole pieces swinging in to collide with the rotor. Fit the new armature - a straight swap - and re-assemble. Make sure that the magnet goes back the right way round or the motor will run backwards! The Hall was the GWR all-purpose engine par excellence. This model is proprietary, by Dapol, with a tender-mounted skew-wound motor and a plastic cardan shaft drive to the driving wheels. The tender was modified, plastic coal removed and replaced with the real thing and a tarpaulin stretched out from the cab roof (well, it sometimes rains even in South Devon!). Otherwise, the main changes are new name and number plates, tender lettering replaced with the “shirt button” motif and a partial repaint and weathering. As someone said, "You can't have too many Halls". This model is proprietary, by Dapol, with a tender-mounted skew-wound motor and a plastic cardan shaft drive to the driving wheels. The tender was modified, plastic coal removed and replaced with the real thing. Otherwise, the main changes were new name and number plates, replacement tender lettering and a partial repaint and weathering. The model is a first essay in 3-D printing. I drew out the basic design in 2-D CAD and my son then converted the superstructure and tender in Solidworks for printing by Shapeways. The chassis is a fairly conventional scratch-built split-frame type with a Nigel Lawton motor mounted in the tender, connected by a wire cardan shaft to the two-stage reduction gear (47:1) driving the centre axle. Driving wheels were from the late Mike Bryant range, similar to the 2mm Scale Association type but with N-gauge tyres. The bogie was from the N-Brass range and the rods and cross-heads were scratch-built. New boiler fittings, metal steps, handrails and other details were added. Current transfer between the engine and tender was by phosphor-bronze springs, soldered to the tender frames and bearing on the insides of the engine frames. The tender chassis again has MB wheels and metal steps and other details and a load of real coal. Lovely work John. The Saint is a particular favourite of me having followed your build of this locomotive on another forum. There is still one, much larger locomotive I don't think you've shown here yet that I feel it is equally impressive! Just returned from an evening with Jerry Clifford and guests, putting the world to rights. There will be a bit more about the Saint tomorrow but you will have to wait a few more days for "The Big One". I made an all to brief first visit to Jerry's last week and got to admire his layouts and work in general. I'm hoping that I'll be in a position to make the trip to Railwells later on this year. Looking forward to seeing more on the Saint. Following from Atso's expression of interest, four more photos of the Saint at different stages. Firstly, the 2D CAD drawing which was the basis of everything. The top elevation is a simplified scale drawing of the prototype. In the centre, the drawing is a 2mm scale version of the model and at the bottom, and at the sides are the tender and various details. then, a photo of the scratch-built chassis. 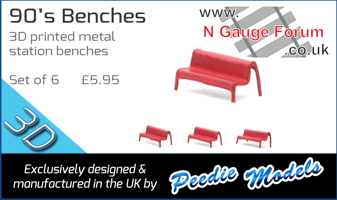 Typical 2mm Scale Association methods but with N-gauge wheels. The split frames (20 thou brass) were spaced with double-sided copper-clad fibreglass, gapped for insulation, and the wheels were on half axles and fit into insulated muffs. I like to be able to remove the driving wheels so I made a keeper plate, complete with cosmetic springs, using the same technique and this was bolted to the main frames. The Mashima motor shown was later swapped with a Nigel Lawton one. The third photo shows the loco in grey primer and almost complete except for connecting rods, cross-heads and sundry details. 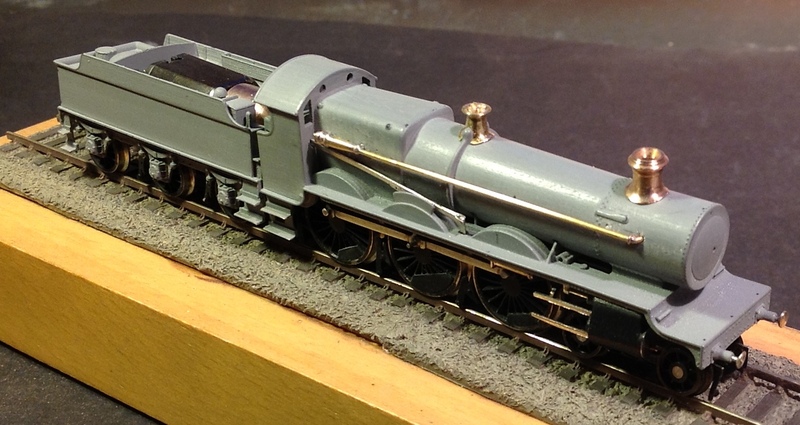 The 3D printing includes the loco superstructure, with loose cylinders and firebox back-head. The separate printing of the 3500 gallon tender comes complete with frames and axle boxes. Loco and tender steps were scratch-built in nickel-silver as, in my view, they would be too vulnerable in printed material. The final photo is of the right hand side of the finished loco The loco and tender are available from Shapeways in 2mm FS (1:152) and N-gauge (1:148), under designer SteamPrint nbs3000. A "straight frame" Saint is also available. More passenger locomotives to follow. I'm fast running out of superlatives so am holding some back, but your scratchbuilding skills are superb. Superb, a beautifully crafted model. Wonderful work John, I'll never get tired of seeing this particular build. While I'm happy making, sanding and painting 3D printed bodies, the scratch built chassis of your Saint is really something to aspire to! Is Totnes still on the exhibition circuit? I saw it at St. Albans a few years ago but not since then. Thank you for your comments. In my view, scratch-building is no more difficult than "heavy" chassis modification but perhaps requires a different mind set. The methods are well documented in 2mm Scale Association publications. Nowadays, probably the main difficulty is sourcing wheels. Yes, Totnes is still exhibitable but nothing currently booked. I continue to do bits on it - well, what layout is ever completely finished! Ashburton is due at Mere next weekend and at Wells in August. Now, a pair of Castles. 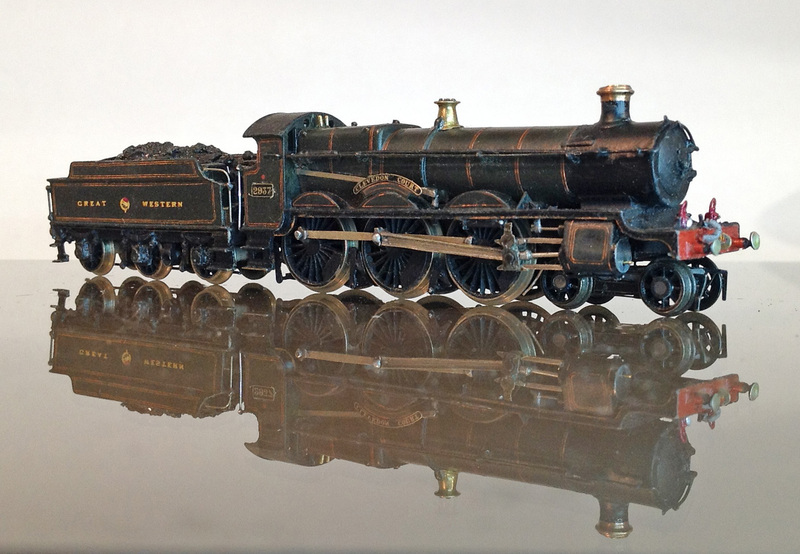 This model was my first attempt at "heavy" modification of a proprietary loco, many, many years ago. However it turned out to be a fairly simple reworking of the old Peco Jubilee – remarkably similar in key dimensions to the Castle. Well, Stanier was trained at Swindon! The model engine and tender chassis and mechanism were unchanged, except for new scratch-built connecting rods, cross-heads and slide bars. The engine superstructure has a slightly raised firebox top in plastic card and a new scratch-built cab to conform to Swindon practice and has new fittings and details added. The tender frames were butchered slightly and the superstructure was scratch-built in plastic card with a very substantial coal load, necessary to cover the vertically-mounted motor. This model is by Farish and has an excellent appearance but is reportedly limited in traction on gradients. Still, it will cope with seven coaches on my (flat) Totnes layout, which was equal to the limit placed on the prototype. It was renamed and re-numbered from "Earl of Dunraven" to "Totnes Castle" (whatever else! ), the daylight over the bogie truck was blanked off with some black plastic card and real coal was added to the tender. Except for a small amount of weathering, the model is otherwise unchanged. Lovely work as always John. As long as funds allow, I intend to travel down to Wells to see the exhibition and would love to see Ashburton in the flesh (and maybe have a chat?). Good to hear the Totnes may be making new appearances in the future. Thanks for the information on scratch building chassis, I'll be having a good but maybe with something a little simpler than a Saint for my first attempt! If you get to RailWells, you will have a feast in store. As well as Ashburton, you will see four 2mm fine scale layouts including John Greenwood's Bodmin and Wenford - an absolute stunner. Jerry and Kim will also be there. Look forward to meeting you and having a chat. Page created in 0.571 seconds with 39 queries.